Capture the wonder and joy of the toddler years with this sweet and lovable toddler ornament. 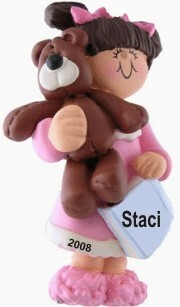 The child with teddy, female brown hair ornament for toddler personalized Christmas ornament will delight her now and provide a cherished memory you’ll both enjoy in years ahead. A display cord is attached to make it very easy to hang the brunette girl with teddy personalized toddler Christmas ornament wherever it provides the most pleasure. These kids ornaments personalized to make them very special are favorites the moment they are received in our classic velvet drawstring pouch.